Although the oranges my father sent weren’t the Sevilles I anticipated, I found a place where I could order some, and promptly did so. While I waited for my order to ship, I began to research marmalade recipes, and of course the internet has many to offer. The internet also has Amazon, which has books on jam-making, and as you peruse the titles, helpfully suggests other books and even jam-making supplies. This is how I discovered that there are special pans just for jam-making, made in France. Since Christmas was still in the air – in spite of its fire-hazard status, our tree had not yet come down – I ordered one last gift, for myself. Since I made quite a lot of jam last year, most of which was gifted to others at Christmas, it seemed like a Christmassy thing to do. Having spent a tidy sum on the pan, I didn’t buy any of Amazon’s cookbook recommendations. Instead, I reserved three titles at our local library: The Blue Chair Jam Cookbook , Blue Chair Cooks with Jam & Marmalade , and The River Cottage Preserves Handbook . The books arrived a few days later; two massive volumes, alongside one small, rather modest one. The Blue Chair books are so big they don’t fit in my cookbook holder, nor leave any work space when lying open on the counter. They are, however, filled with glorious photographs of fruit, and orchards, and the author, wandering wistfully among the fruit trees in an orchard. The photographs don’t interest me, of course; I’m looking for recipes, and there are many, and they are detailed, and though the ingredients don’t contain too many surprises – fruit + sugar = jam – the technique employed is a marvel of detail, requiring three days to make each batch of jam. I wouldn’t necessarily mind taking three days to do nothing except wander in an orchard and make jam, but according to the author of River Cottage Preserves, as well as my own jam-making experience, I don’t actually have to: just a few hours will do the job. That said, I did pick at least some of the fruit involved, though it wasn’t in an orchard, it was on the campus of the college near my house, sections of which are overgrown with blackberry bushes. I filled my freezer with bags of berries in August, something I may not be able to do again, as the college recently bulldozed the blackberry bushes, leaving behind a wide swath of mud and a number of homeless bunnies. Making jam – or in this case, fruit butter – in a pan designed expressly for that purpose is a hypnotic experience. The pan is wide and shallow, with sides that flare out, all of which is intended to increase the speed of evaporation and reduce the cooking time, resulting in a fresher tasting jam. I was a little skeptical that a pan could make that much of a difference, but once the berries and apples got started, the steam coming off the pan was something to behold – rapid evaporation, indeed, but also rather beautiful to watch. I’ve always liked apple butter, though often I am disappointed when I buy a jar – dull color and flavors can be somewhat dispiriting, especially in the dark days of winter. Adding blackberries creates a butter with a bright, lively flavor and a regal purple color. The house smells like Christmas as it cooks. I used honeycrisp apples, but any good baking apple will work. I accidentally increased the amount of sugar the original recipe called for, but the final result was a slightly more firm butter with wonderful spreadability and a very smooth texture, so I wouldn’t change it. Cut the apples into fairly large pieces, trimming away and bruised or bad bits. Place in a pan with the blackberries, cider, lemon juice, and 2½ cups water. Bring to a boil and cook gently, until the liquid is greatly reduced and the apples are very soft. Run the fruit mixture through a food mill into a bowl, and clean out your jam-cooking pan. Measure the volume of fruit pulp and return it to the jam pan (I had five cups). Add ⅔ cups of sugar for each cup of fruit pulp, along with the cinnamon and cloves. Slowly bring to a boil, then simmer until the mixture begins to sputter and is very thick. Stir frequently to avoid scorching. Remove from the heat and pour into sterilized jars. Put lids on the jars and process in boiling water for 15 minutes. Let cool completely, and use within a year. Before The Dog died, I decided it would be a good idea to order myself a gift, so that something would arrive to cheer me a few days after. The gift I chose for myself was Claudia Fleming’s regrettably out-of-print The Last Course: The Desserts of Gramercy Tavern , about which I keep hearing rave reviews, and it strikes me that a cookbook that is still being talked about ten years after it was published is probably a cookbook worth checking out. My library didn’t have a copy, and in late December, the cheapest used copy on Amazon was $140. That seemed kind of steep for a cookbook, so I waited, and sure enough, after Christmas, prices started to drop, a little each day, and then suddenly a couple of sellers dropped their prices by quite a bit, but then raised them again – on Amazon. But one of the sellers left his low price – $70 – on Abebooks, while copies were still selling for over $100 on Amazon – and after a couple of days and a little rationalization on my part, this seemed like a very good deal, and I bought it. We’ll ignore the fact that prices continued to drop on Amazon, and if I’d waited just a week or two, I could have saved myself another $20. In fact, we’ll just stop looking at the prices. They don’t matter, because the cookbook arrived, and I had all the ingredients I needed to make the gingersnaps, and they were truly the loveliest gingersnaps I’ve ever made. I had a big container of them waiting for Mr. Faraway when he visited, only to discover that although he seems to like nearly everything I make, he doesn’t like gingersnaps regardless of who made them, and now I’ve got a dinner guest and an ample supply of something that won’t pass as dessert after all. I also have a large butternut squash that I bought for some reason – probably a very good one – and The Last Course has a recipe that I would have probably bypassed for the rest of my life, were it not for the fact that it calls for butternut squash, and I have one, and I need to do something fairly quick and simple for dessert. Mr. Faraway says, I don’t really see how a vegetable can be dessert. I point out that pumpkin can be pie, and that’s both vegetable and dessert. Let’s give it a shot, he says. He does all the dicing and peeling, while I manage the cooking for the recipe, which we made together as the spareribs roasted. I immediately hit a speed bump, discovering that I’m short by half the amount of maple syrup the recipe calls for, so we agree that swapping in some honey for the rest was probably the safest solution. It all smells incredible while cooking, and when the squash is tender enough to sample, we try it and discover it tastes just like pumpkin pie. The combination of reduced maple syrup, honey, and caramel becomes quite intense, so the compote is very rich – a little goes a long way. Fleming suggests serving it with gingersnaps, which was not an option on that evening, or a pound cake, which would be delicious soaked in the syrup. We opted to serve it over plain vanilla ice cream, elevating it into a very special dessert. We agree it would be a super topping for any number of things, especially brunch-y things, and the following morning, we make a batch of Kate Smith’s Griddle Cakes, pouring the compote and syrup on top, for a true breakfast treat. Combine the syrup, cinnamon and cloves in a pan with ¾ cup water, bring to the boil and reduce for 7 minutes, until slightly thickened. Add the squash and simmer until tender and partly translucent, about 10-12 minutes. Remove the squash from the syrup and set aside, and reduce the syrup for another 7 minutes. Strain, and set aside. Heat an 8-inch skillet and melt ¼ cup of the sugar, shaking the pan. Add another ¼ cup, melt, add the final ¼ cup. Heat until it reaches a rich golden brown colour. Add the apple chunks in one layer and turn off the heat. Don't stir. Baste occasionally as the apples heat and release their juices. To serve, add the apple and squash to the remaining maple syrup and heat through. I didn't have the correct amount of maple syrup on hand and didn't discover that small fact until cooking was underway. I substituted honey for about half the maple syrup and it was quite delicious. 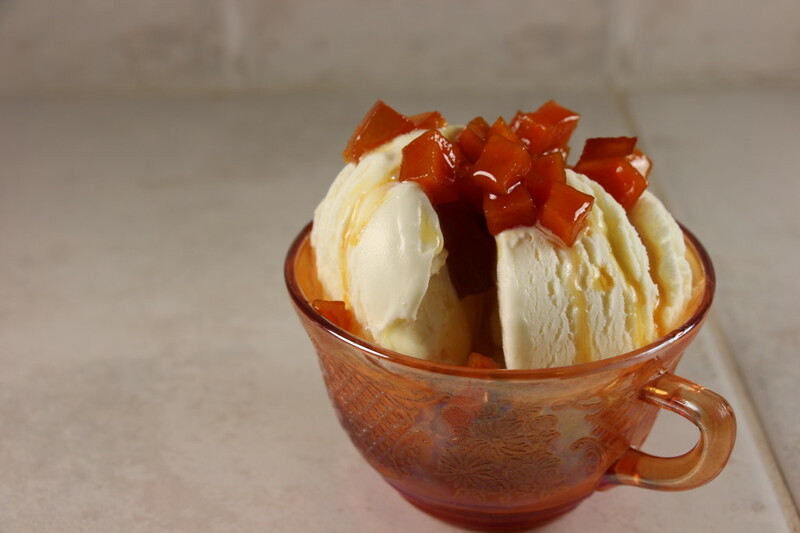 I like to use Grade B maple syrup (easily available at Trader Joe's and elsewhere) as I find it has a heartier flavor than Grade A.
I served this the first night over plain vanilla ice cream, and it was spectacular. The following morning, I served it over pancakes, and they were divine.